Morocco is one of the best travel destinations. But if you want the best of the country, its imperial cities need to be included in your list! The country is boasting two imperial cities, but the focus here will be Marrackesh. The imperial city is situated in the base of Atlas Mountains. It is a city that boasts stunning views and history. Take a look at the recommended attractions to visit below! The tourist attraction is just one of the most popular landmarks in the city. It is where you can mingle with others freely and just enjoy a day of watching a range of activities. Such activities and performances you can enjoy here include snake charmers, acrobats, fairground and comedian acts, dancers and drummers. New York is known for its Statue of Liberty and Paris for its Eiffel Tower. 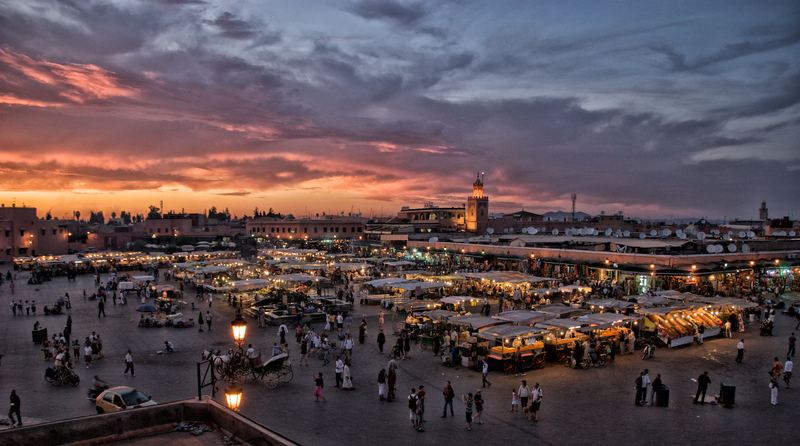 Marrakech also has the same infamous attraction – the Koutoubia. It is a dominating landmark in the entire city of Marrakech. The landmark came to be due to the hard work of the early Almohads, which is one of the 3 Alomahad towers. It is also the oldest among the three, which include the Giralda located in Seville and the Hassan Tower situated in Rabat. It is the city’s famed labyrinth Medina, Old City. What made it worth to be included in the top list are its alleyways that are in a range of colors, sounds and scents. Here, you can wander and enjoy the range of shopping opportunities present in the place. Just do not get yourself lost while wandering! Some of the shopping places you should not miss here are the El-Attarine Souk for its spice and perfume, Babouche Souk for its shoes and Cherratine Souk for its leather goods! It is an attraction known as Morocco’s largest theological college. The Islamic school of learning was built by the Saadians in the year 1565. What made it a good place to visit is its architecture, which was designed in the Islamic style. The interior of the place is also something to look at with its zellige tiling and stalactite ceilings. The Kufic inscriptions also made the place more of a stunning interior as they are used as decors. All these are the highlights of the Medina. The palace was built during the nineteenth Century to serve as the Grand Vizier Bou Ahmed’s residence. Just like with Medersa Ben Youssef, the architecture and interior of the palace are its highlight. The interior is decorated with dazzling zellige tiles, ornate wrought-iron and painted ceilings. The combination of its stunning interior and architecture is completed with tree and flower-filled gardens, which it is surrounded with. The imperial city of Marrakesh comprises plenty of stunning attractions, which you will further see and have the chance of exploring once you get there. So, if you want all of these attractions to be part of your itinerary, it is time you start planning it!